After the lullaby hits by Baby Roxers in 2016 there seems to be a Rox metal project in 2017. GS Productions is a Russian independent music label. In November they announced an official metal tribute to Roxette and they called for participants. They say they have an official permission from Roxette and that all information about the compilation will be announced on Roxette’s website. There we can’t see anything yet, but GS Productions posted on their Russian social media site (vk.com) the final list of metal bands participating in the project and which of them covers which Roxette song. Joyride and Fading Like A Flower seem to be very popular, since these 2 songs appear twice, each covered by 2 different bands. 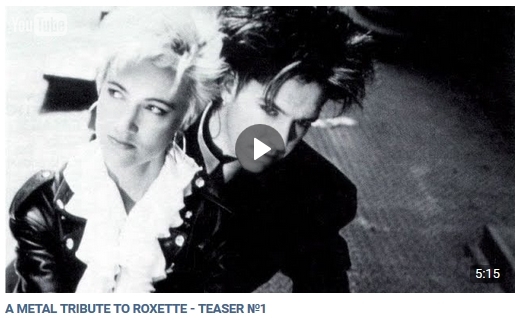 There is a teaser on YouTube that includes the titles of Roxette songs and the above mentioned metal bands next to the hits. However, in this video there are 2 additional bands and tracks vs. what GS Productions posted on their site. The additional 2 songs are Almost Unreal (From Autumn) and Milk and Toast and Honey (Paid Charons Fare). The release date is set for 1st September 2017. The compilation’s cover design can be done by volunteers as GS Productions states and the best one will be chosen by Roxette. Hm. Let’s see what happens. Well, it wouldn’t be the first time Roxette songs get metal arrangement. There was that Swedish Hitz Goes Metal project in 2011 where The Look, Listen To Your Heart, Joyride and Sleeping In My Car were covered and 2 years later on Vol. 2 (Japanese release only) there was Dressed For Success. Not sure how often any Roxer listened to these versions though.